These entrepreneurial souls were camped out in front of Trotta's, our local grocery store, on Saturday, flagging down the passers by to sell their Thin Mints (which always sell out first), Samoas, the ones I bought, the Thanks A Lot. 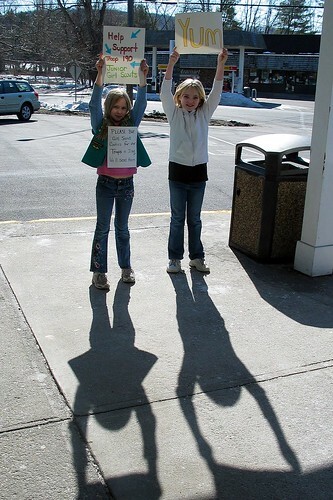 These girls were also raising money to send cookies to the troops in Iraq. You go, girls! Tomorrow, the lambs of Spring. Sharon CT Daily Photo will be one year old on March 30 - come celebrate with me! I used to be in the Brownies, then Girl Guides then Ranger Guides. I used to love the camping trips. Looking forward to those lambs. We're back to shadows! Very good one, this. Re.Ruth's comment, the Brownies being the primary entrance level for the youngest, I went to join the boys equivalent, the Cubs. I have no idea why, but I was the only kid I ever knew to be refused entry. What did I do? I only tried once, that was the end of it. I'm still suffering from the rejection complex. I'm still waiting for the Girl Scouts to make it down here some March so that I can have some thin mints...oh how my mouth is watering!